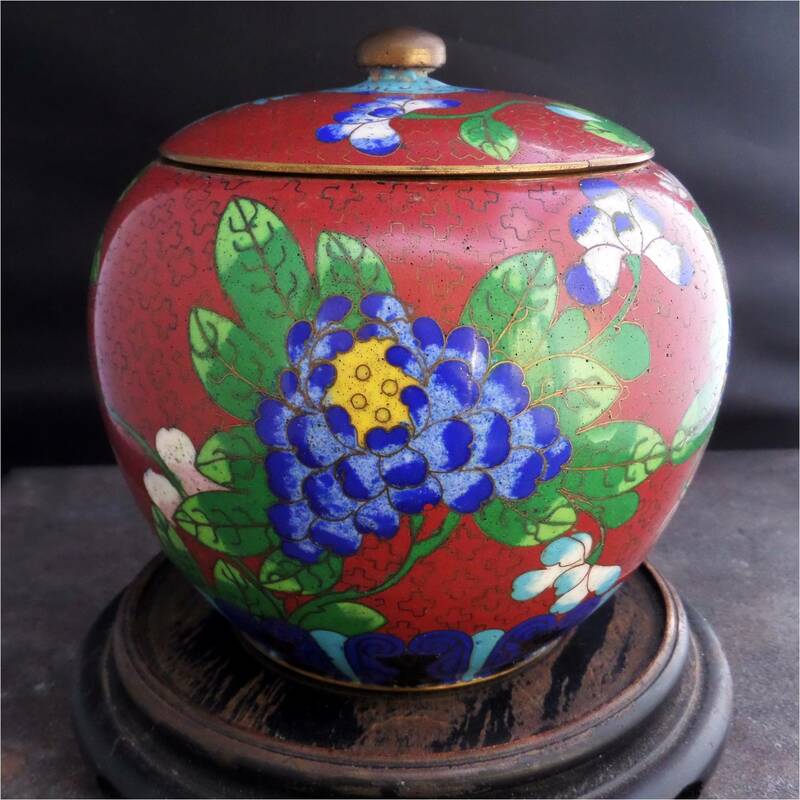 What happened in the Chinese cloisonne workshops during the ten years between the organization of the workshops in the mid-1950s and the Cultural Revolution in 1966? Accounts from various sources (books, online) agree that the condition of the workshops was deteriorated and impoverished after the wars and economic turmoil of the previous 40 years, with many older artists unable to support themselves by their craft - Jin Shiquan, for example, was selling almond milk on the streets of Beijing. Thus a modest guaranteed income in a state-supported enterprise and the ability to once again create cloisonne was welcome. Did this result in a burst of enthusiasm and a revival of inventive artistry? Features three of the "Four Gentlemen" representing the four seasons - Chrysanthemum, Orchid, Plum Blossom, Bamboo. JingFa characteristics such as a graceful naturalistic rendering of the flowers, two-tone leaves with blended tonal graduation, pastel hues, rocks composed of jagged concentric wires. 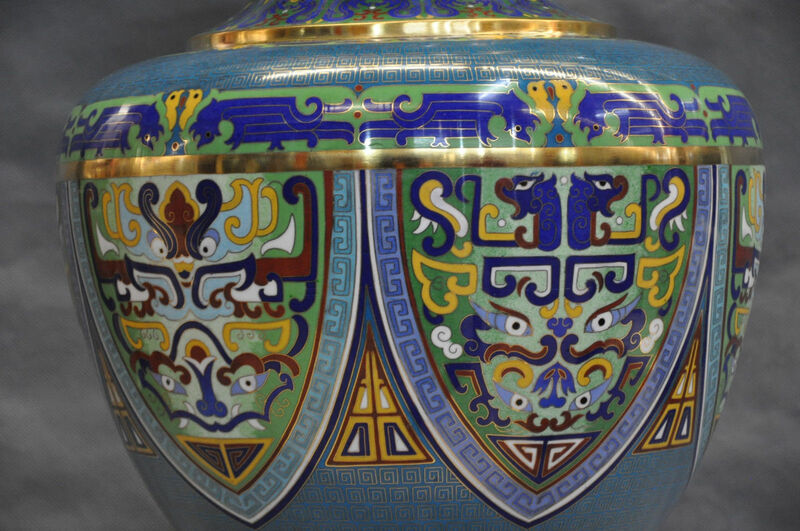 However, the enamel colors are all traditional colors, albeit rendered in lighter tones, and the rocks feature sets of curved parallel lines characteristic of such rock motifs from all the way back to the 1880s-1900s. The background pattern of squared spirals seems to be a later adaptation of a traditional motif. 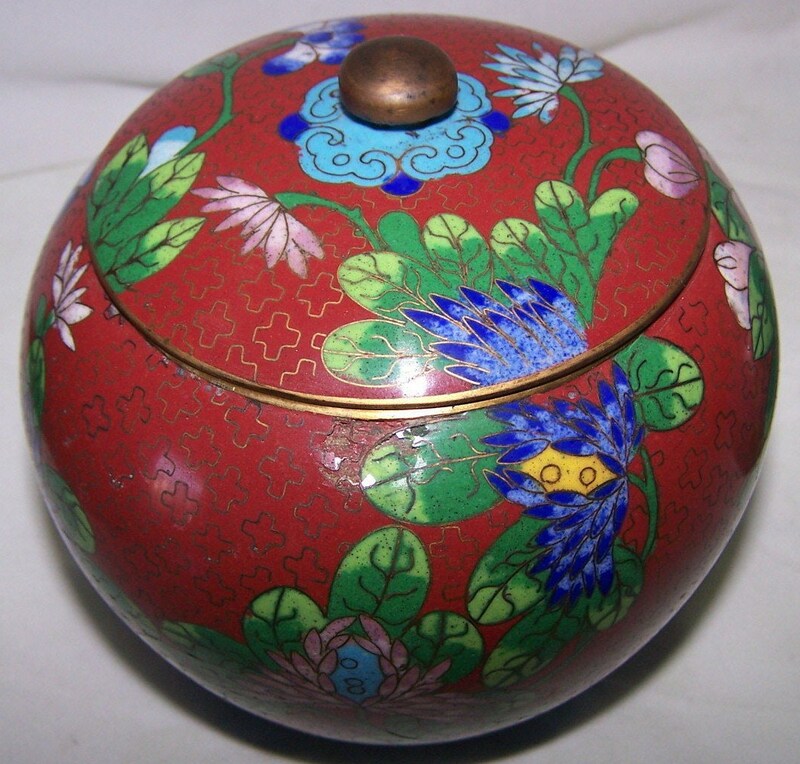 It appears often on contemporary Chinese cloisonne pieces. 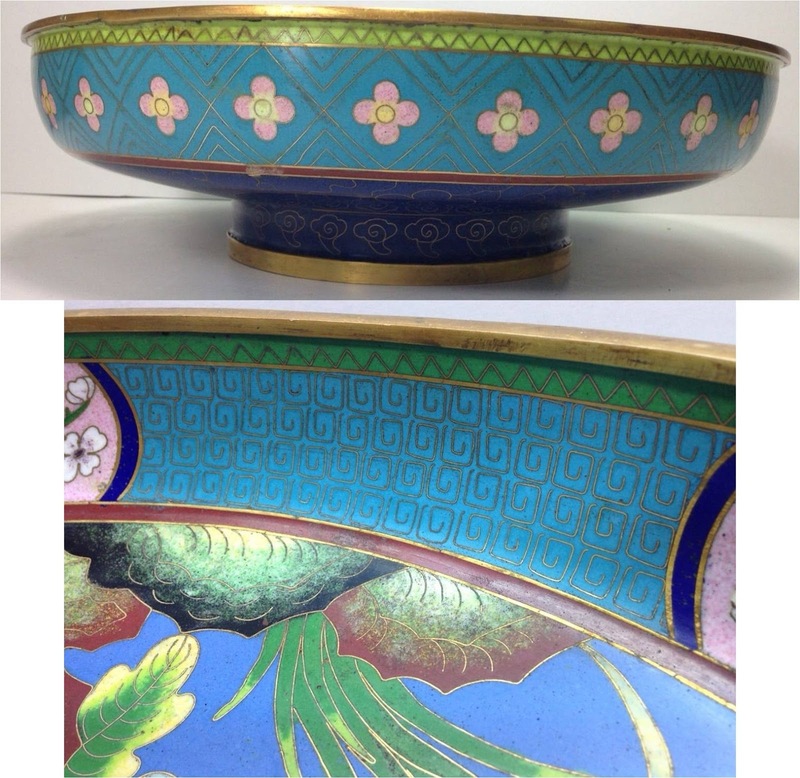 The label seems to read "Veritable Cloisonne, Product of Cathay China"
A distinctive floral pattern and granite blue color for the back enamel. What's not to like about this extraordinary piece? 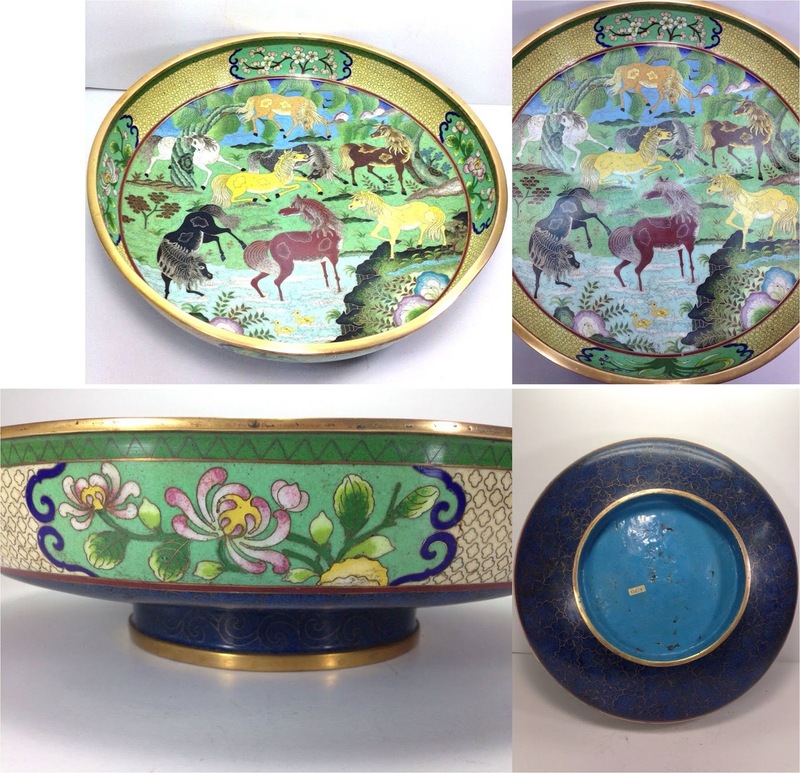 A folk-art landscape with lively Ming-style horses in an inventive painterly use of traditional enamels - tonal blending, not just crayon-coloring-book type use of enamel. The background pattern of rounded cross shapes seems to be later than a similar but more sharp-edged diaper pattern likely used around the 1920s. Blossom buds wired in older 3-wire style. 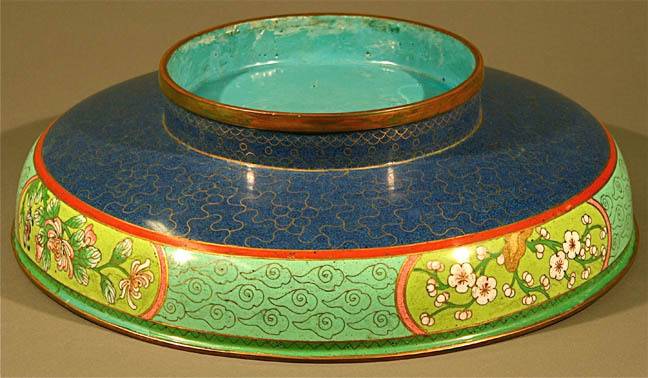 A similar back enamel of flowers and wavy lines, granite blue enamel. 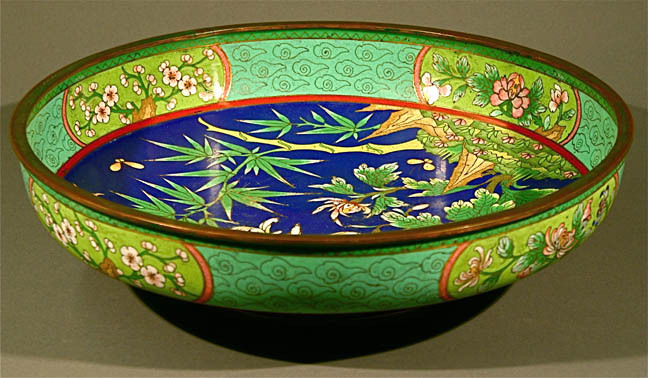 A bowl in similar style appeared in an online auction, the seller estimating it to be "late 19th - early 20th century:"
This time the bamboo member of the Four Gentlement is featured. Less elaborate butterflies, leaf-shading not as tonally graduated, old-fashioned pointed rocks, "bamboo-shoot" pattern in undergrowth. Note the tailed clouds, somewhat simpler flower-and-wavy line granite blue back enamel. 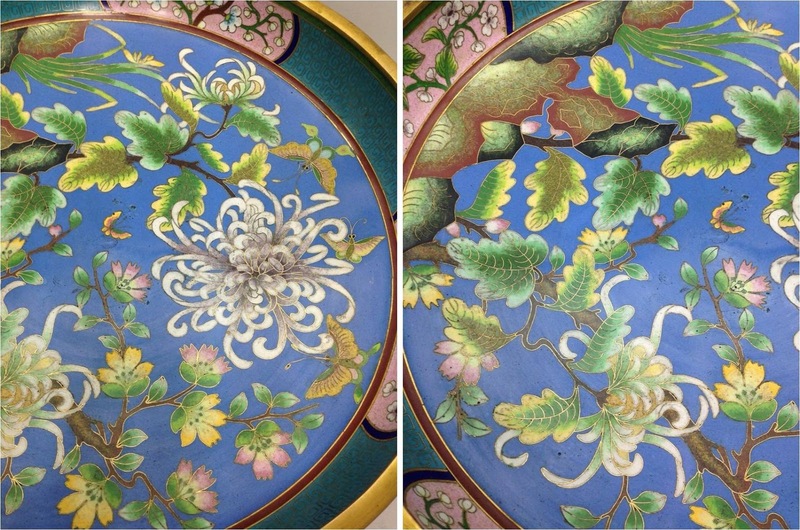 Are these pieces the work of an older artist such as Jin Shiquan, adapting past motifs and patterns to new-found artistic freedom in the factory cooperative, or are they from 50 years earlier? What do you make of this puzzling evidence? An innovative combination of colorful old-fashioned floral motifs with geometric background patterns. The scroll with tiny leaves appears in prior decades, but the square spirals and the trefoil circles seem more modern. Creamy turquoise blue and granite blue enamels. 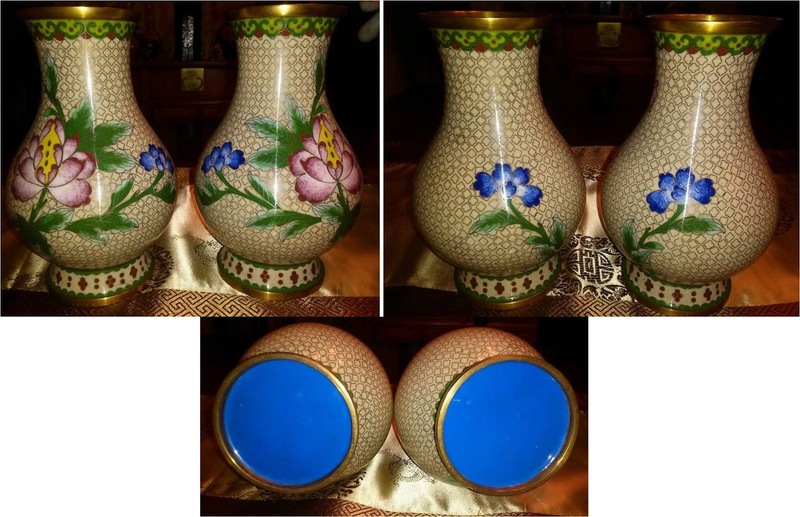 Vase pair offered by eBay vendor sea-n-sand. 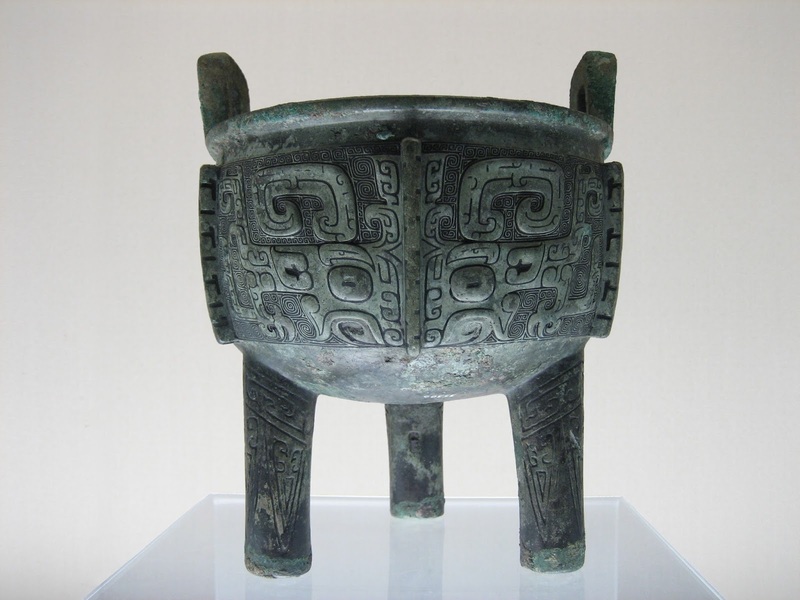 "This set was purchased in China during the early 1950s by a local professor. We purchased them from his estate in the late 1980s." A more rounded and tightly arranged cross diaper compared to the earlier red jar below. Small dish with rounded cross diaper whose owner purchased it in Moscow in the 1950s. Jar likely to date from around the 1920s-30s with a cross background diaper. A modern beast face jar with very precise scroll diaper.